How your purchase helps Amnesty - Amnesty International UK shop. Fair trade. Organic. Ethical. As a global movement of over seven million people, Amnesty International is the world's largest grassroots human rights organisation. We investigate and expose abuses, educate and mobilise the public, and help transform societies to create a safer, more just world. We received the Nobel Peace Prize for our life-saving work. Amnesty International United Kingdom has teamed up with New Internationalist to bring you amnestyshop.org.uk. Revenue from the shop supports Amnesty’s work and various other good causes from around the globe as the majority of products are organic, recycled, fairly traded, educational or eco-friendly (see Ethical Buying Policy). There is also a great selection of Amnesty branded gifts and treats. At least 10% of the total sales from the Amnesty Shop goes directly to Amnesty International United Kingdom Section. Your order will be processed by New Internationalist Publications Ltd. who bear all the costs associated with running the shop operation. 100% of donations will go directly to Amnesty International UK Section Charitable Trust. Amnesty International United Kingdom Section is a company limited by guarantee, registered in England and Wales (01735872). 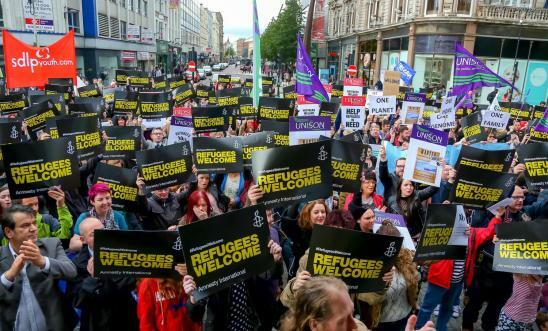 Amnesty International UK Section Charitable Trust, is a company limited by guarantee and registered in England and Wales (03139939) and a registered charity in England and Wales (1051681) and in Scotland (SC039534).